The Sam Davidson Memorial Trophy will reside in the Montreal Carabins’ trophy cabinet for the first time in the program’s history. A 109th minute winner from Tournament MVP Frederic Lajoie-Gravelle gave the Carabins the victory they’ve so desperately sought, eking out a modicum of revenge on Cape Breton for the Capers penalty shoot-out win against them in last year’s U SPORTS championship game. The quest for gold has been a long one for the Carabins, 18 years in the making. The men’s soccer program began in 2001. Since then they’ve won three bronze medals (in 2003, 2006, and 2008) before finally advancing to last year’s U SPORTS final, only to head home with silver after that dramatic penalty shoot-out loss to Cape Breton. Pat Raimondo has been the only head coach in Carabins history. He made mention after Friday’s semi-final win over Trinity Western that they’ve been chasing the trophy for 18 years. That long wait is now over. “Very proud of them,” a delighted Raimondo said after the match. “They showed a lot of character. As soon as we opened camp this year, we had one thing in mind – to get back to nationals and try to right and change the taste in our mouths from last year’s PK loss. Last year’s final served up goals and drama, and the repeat was even better, with non stop action and fast paced play from the first whistle to the last, as both teams went hell to leather for 120 minutes. Montreal came out all guns blazing and took the lead just 82 seconds in when Kareem Sow sent a beautiful ball forward for Guy-Frank Essome-Penda to run onto and chip the onrushing Ben Jackson in the Cape Breton goal for a beautiful finish. M⚽️ // GOOOOOOALL! Guy-Frank Essomé Penda finds the back of the net and @Carabins lead 1-0 against @gocapersgo. The action was end to end, with neither team getting their breath and neither defence getting much respite, and the Capers tied things up a minute before half time through Caelann Budhoo’s wonderful solo effort that saw him run at the Carabins back line, leaving players standing in his wake, before slotting the ball past Felix Goulet for the equaliser. M⚽️// GOAL! @gocapersgo tie the game 1-1 in the 44th minute. Both teams continued to go for it, but as the game wore on you felt it was Montreal that were most likely to get the breakthrough, looking the more dangerous side. Montreal should have won it 15 minutes from time when Zakaria Messoudi crashed one of the bar and when the rebound fell to the usually clinical Lajoie-Gravelle with the goal gaping, he fluffed his lines and fired wide. And with no other clear cut opportunities, the match headed into extra time for the second straight year. The match was still very much up for grabs, but when AUS Player of the Year, and Victoria Highlanders defender, Peter Schaale saw red after picking up a second yellow in the first half of extra time, you felt it was going to be a tall order for Cape Breton and so it proved. The winner came in the fourth minute of the second period of extra time, and it was perhaps fitting that it was Montreal’s two standout players that combined to get it. 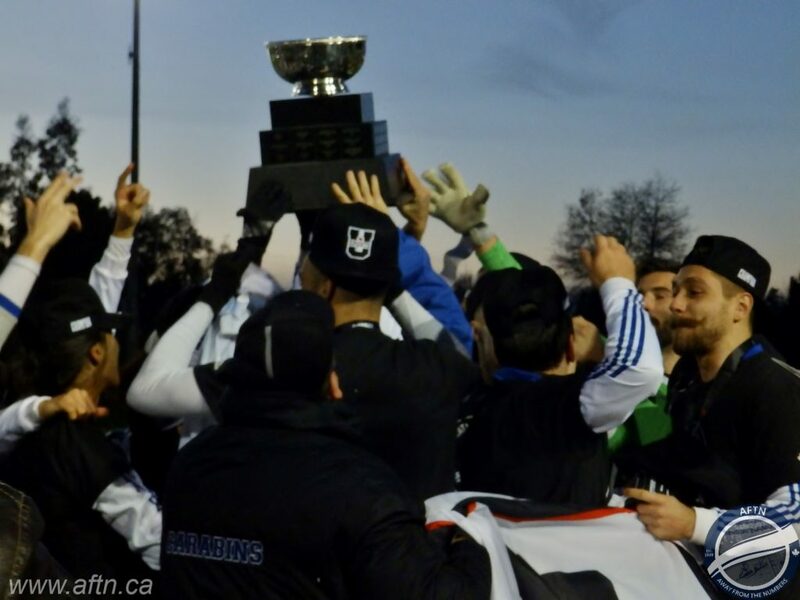 Omar Kreim went on a fantastic run that had the Capers’ Lewis White turned inside and out before the Moroccan send in a perfect cross to the near post for Lajoie-Gravelle to fire home from close range and secured the Carabin’s first national title. Trophy secured, Raimondo is already looking for a rematch with the Capers next year, saying their series is now tied at one apiece. With the quality both teams had on display, you certainly wouldn’t bet against that happening and you also wouldn’t want to miss it. The Carabins and the Capers were the two best teams throughout this year’s tournament, both with deadly attacks, solid defences, and some standout players that look to have very bright futures ahead of them. And for all the impressive attacking players on display in the championship game, and throughout the whole tournament, it was the Carabins defence that really stood out, giving up just two goals over their three matches and seldom looking in trouble. Two fantastic individual goals aside, they were strong to a man. The win was Raimondo’s second national championship as a head coach, having lifted the famous old trophy back in 1997 with McGill Redmen. As special as that victory was, Raimondo admits the magnitude of it didn’t really sink in at the time. But after a two decade wait to win another, there’s no chance of that being the case this time around. “When I won it in ’97 with McGill, I was perhaps too young to understand or to enjoy the moment,” Raimondo told us. “It was only my fourth year in the league. Now it’s my 25th year, so it took 21 more years to get back to the final and to get back to the Cup. 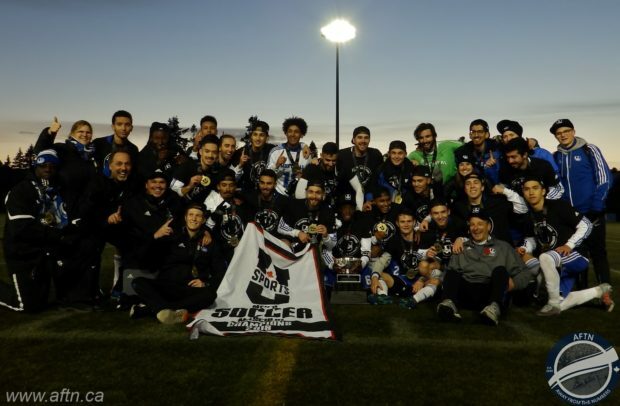 For a program often overshadowed on the football pitch by Laval Rouge et Or and UQAM Citadins these past few years, Raimondo has built a quality packed squad that’s now made it to back to back championship matches, winning one of them. It’s a Carabins squad that will be losing just one graduating player, albeit a hugely important one in Lajoie-Gravelle, but with 11 rookies and five second year players on his roster, this is a team that’s going to be challenging for the top honours for several years to come. 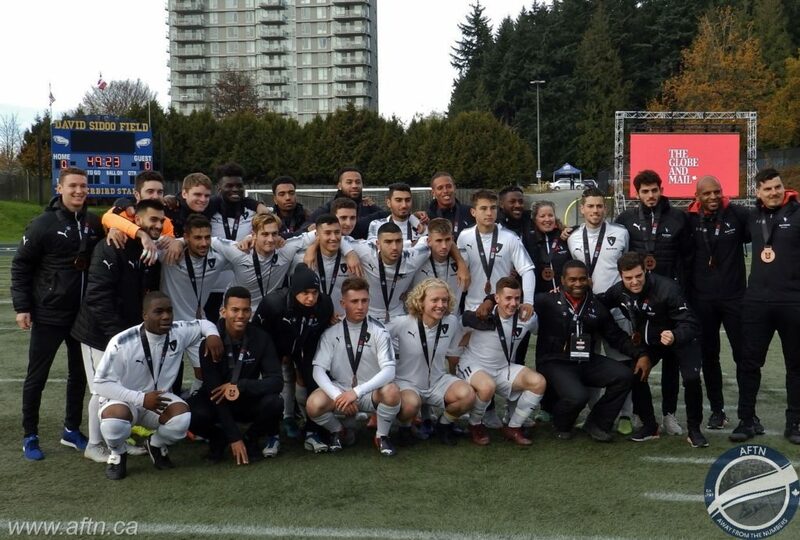 There was disappointment and heartbreak for Trinity Western Spartans in the bronze medal match as they were systematically dismantled by a strong Carleton Ravens side that must be leaving the tournament fairly happy with a medal but left with lingering thoughts as to what could have been for the talented team. The Ravens have a special player in forward Gabriel Bitar, who was arguably the Player of the Tournament ahead of the Citadins’ Lajoie-Gravelle. And the man that broke UBC hearts on Thursday in the quarter-finals put the other BC representatives to the sword in their Bronze medal match up, hitting a brace in the 25th and 68th minute, with a goal from the equally impressive centre back Christopher Malekos sandwiched inbetween for a 3-0 victory. Heartbreak for the Spartans, who did so well to even reach the nationals, never mind knock out the number one seeded York Lions in the quarter-finals, but with five key seniors now graduating, there’s going to be a rebuild out Langley way this offseason.